The long-run goal of the National Space Society (NSS) is people living and working in thriving communities beyond the Earth, and the use of the vast resources of space for the dramatic betterment of humanity. The foundation of the NSS strategic plan for obtaining this goal is the promotion of certain key ideas. If you have the right ideas (and we do), then these can be extremely powerful tools, particularly over the long run. Our key ideas include the importance to the human future of lunar resources, asteroidal resources, energy resources (space solar power or SSP) space settlement, and commercial space. These ideas interact. Progress on one makes progress on the others easier. Today we are winning with respect to all five of these ideas. NSS has been promoting the importance of lunar resources since the 1975 beginning of the L-5 Society, one of the two organizations which merged in 1987 to create NSS. See, for example, the second issue (October 1975) of L-5 News (all pre 1980 L-5 issues can be found in the NSS L5 News archive). The discovery of substantial amounts of water on the Moon means the development of all of the Moon’s resources has become dramatically easier. Water can be disassociated into its oxygen and hydrogen components, which together make an excellent rocket fuel. Examples of how this fuel can be used include return trips from the Moon to Earth, for transporting satellites from low Earth orbit to higher orbits (such as geosynchronous orbit) and to refuel missions to Mars. SpaceX, in cooperation with the government via the COTS program, has substantially lowered the cost of space transportation and is likely to continue doing so in the future, thus hastening the day when lunar resources may be developed. In July 2014, cosponsored by NSS, the “Low Cost Strategies for Lunar Development” workshop was held at Draper Fisher Jurvetson, one of the leading venture capital firms in Silicon Valley. The workshop found that, thanks in large part to lunar water and SpaceX, a base could be built on the Moon for an order of magnitude less than estimated by earlier studies. A few months later, the NASA Ames “Lunar Station” study, led by NSS Senior Vice President and Senior Operating Officer Bruce Pittman, came to similar conclusions. I presented the results of this study in Toronto during the 2014 International Astronautical Congress. The soon to be released “NexGen Evolvable Lunar Architecture” study, funded by NASA and led by former NSS board member Charles Miller, reinforces these results. NSS and the Space Frontier Foundation held a press conference on July 20, 2015 to publicize the conclusions of the NexGen study. NSS advocated the use of asteroidal resources following the use of lunar resources from the beginning of the L-5 Society in 1975. 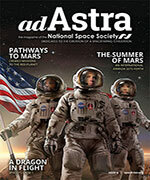 NSS first suggested that we may wish to develop asteroidal before lunar resources in the April 1977 issue of L-5 News. Today there exist two private firms dedicated to mining asteroids, Deep Space Industries and Planetary Resources. In 2014, the “Economics of NEOs” Conference was sponsored by and held at NASA Ames. Its results were favorable regarding asteroidal resources. The soon-to-be-released International Academy of Astronautics study, “Space Mineral Resources,” is substantially more favorable. This study was led by Art Dula, who currently serves as an NSS board member and was the first general counsel of the L-5 Society. NSS has promoted space solar power since the first issue of L-5 News (September 1975). In 2011, the prestigious International Academy of Astronautics completed their favorable study, “Space Solar Power, the First International Assessment of Space Solar Power….” SSP is one of the 10 official goals of the Japanese space program. In 2011, China announced the existence of its previously secret SSP program. Subsequently, China’s program has become the most aggressive in the world. Li Ming, the number two person in China’s equivalent of NASA, is a strong proponent. His paper, written for ISDC™ 2015, concludes, “SSP is one of the important potential renewable energy ways in the future of China and the world.” In April of this year, the Northrup Grumman Corporation, one of America’s largest aerospace and defense companies, and the California Institute of Technology (Caltech) announced the existence of a joint SSP program. Northrop Grumman has been and will continue to sponsor with their own (not government) money—a three-year, up to $17.5 million SSP technology development program at Caltech. This is aimed at the further development and cost reduction of key SSP technologies. Space Settlement has been at the center of the rational for the existence of NSS since the beginning. See, for example, L-5 News, December 1975. A lunar settlement was the explicit goal of the previously referenced NSS-cosponsored 2014 “Low Cost Strategies for Lunar Development” study. This was followed a few months later by the favorable “Next Giant Leap” conference in Hawaii. 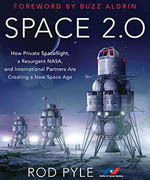 This was also cosponsored by NSS and was aimed at developing a lunar base, which would evolve into a lunar settlement. The “Space Pioneering Summit” was held in February of this year. It was a high-level, invitation-only, two-day workshop cosponsored by NSS. Top people from NASA and the aerospace industry were in attendance. It concluded unanimously that Space Settlement should be the long-run goal of the American human space program. A week later, a press conference was held in the hearing room of the House Subcommittee on Space to announce the creation of the Alliance for Space Development (ASD). The principal members of ASD are NSS and the Space Frontier Foundation. Ten other organizations are also members. Its purpose is to promote, primarily through legislation, nothing less than Space Settlement. NSS has always promoted commercial space. An early example is L-5’s successful 1979 campaign to defeat the anti-free enterprise Moon Treaty. Today, commercial space is booming. SpaceX, via the COTS program, developed its Falcon 9 rocket (the workhorse of its fleet) at an audited cost that is an order of magnitude below what NASA and Air Force cost models predicted it should have cost. The assumed use of a COTS-like approach for returning to the Moon has much to do with the recent estimates that a lunar base can be built at an order of magnitude cost less than earlier estimates. A majority of the leaders in commercial space (New Space) are or have been members of NSS and/or the L-5 Society. This fact, as well as the other facts in this column, demonstrates the remarkable effectiveness of our strategy of promoting key ideas. Lori Garver, former deputy administrator of NASA and former NSS executive director, gave a keynote address at ISDC™ 2015, titled “Thirty Years of Space Activism.” In her own words, she told the audience that WE ARE WINNING. This article was written by Mark Hopkins, Chairman of the Executive Committee of the National Space Society. The article originally appeared in Ad Astra, Fall 2015.